ARE YOU KIDDING ME … JUST HOW FRIGGIN OFFENSIVE COULD THESE PEOPLE POSSIBLY BE? The Claremont United Methodist Church, about 30 miles east of Los Angeles, California, and John Zachary, the individual behind the “artistic interpretation,” has managed to infuriate many with their depiction of the Nativity scene this Christmas season by replacing the baby Jesus with Trayvon Martin. Yup … because some how I get the two of them confused all off the time. I just have two words, “Sacrilege” and an “Abomination”!!! 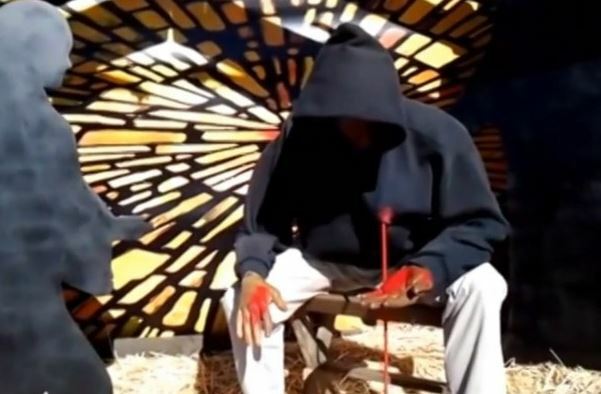 All in the name of “artistic interpretation” these fools have managed to desecrate the Birth of Christ by replacing the innocence of the Baby Jesus, the son of God, Our Savior with the hoody-wearing, Trayvon Martin, slumped over, shot in the chest with blood pouring out on to the ground. UNREAL. Wow, because some how Trayvon Martin is supposed to symbolize the innocence of a child, really? Who knew the drug using, pot smoking, middle finger displaying, gun carrying, school skipping, gangsta fightin’ thug was so innocent. Oh that’s right, those pics were not immiscible. One does not even know where to begin here. In the name of “social justice” they would do such sacrilege. But such things are perfectly okay, because while defaming the birth of Christ, there is a liberal message. You can poke others in the eye, but then cry foul when there is an overwhelming negative response. In the past, Zachary has depicted Mary and Joseph as a modern-day homeless couple; as Mexicans stopped by the U.S.-Mexico border fence; as Iraq War refugees; and in 2010, just Mary by herself, as a black woman in prison with her baby. What, you mean that they have not portrayed Mary and Joseph as Michelle and Barack Obama? Or is that next year? On the lawn of a Claremont church, just like at many churches at this time of year, cutouts of wise men on camelback head toward a makeshift stable, a meager wooden structure where Mary and Joseph have huddled inside. But instead of an infant Jesus cradled in his mother’s arms, the Nativity at Claremont United Methodist Church — the creation of congregant and artist John Zachary — features a depiction of Trayvon Martin slumped over in his hoodie, a pool of his blood spreading over a bed of straw. For several years, Zachary has brought his artistic interpretations of the Nativity — as well as the occasional controversy — to the church, as he used a scene that traditionally conveys themes of joy and innocence to spread messages of social justice. Over the last few years, his installations have touched on homelessness, poverty and acceptance of gay families. He decided over the summer that this year’s scene would include the Florida teenager whose shooting death captured the nation’s attention. Zachary said he wanted to draw a parallel between rampant gun violence and the dark time in which Jesus was born. Want to get even more outraged, watch the VIDEO below of John Zachary attempted to explain his twisted and deranged logic of his interpretation meant to shock people. Sorry, but this is not supposed to be thought provoking, it is just meant to be PROVOKING! Just curious, why is innocent gun violence depicted as Trayvon Martin? If one is going to go this route, wouldn’t true innocent lives lost at the hands of gun violence be the 20 children that were killed at Sandy Hook Elementary School? In the VIDEO below check out the shirt that John Zachary is wearing … Islam convert Mohammed Ali, hmm, I think some one just lost a bit of credibility. Zachary,57, told media he added the slain teenager’s likeness this year to show the parallel between rampant gun violence and the dark time Jesus was born in. Check Out their Facebook page with comments of individuals who are outraged and disgusted. But what else should we expect from a Hollywood production designer? Next year I guess the Baby Jesus will be replaced with Mohammed. I can’t wait until 2016 when Mary and Joseph will be Bill and Hillary Clinton and the baby Jesus will be the Obamamessiah. According to accounts, Zachary’s 2011 Nativity display included depictions of gay couples and was vandalized and investigated by police as a hate crime. Imagine that … because there is nothing hateful about depicting Mary and Joseph as a gay couple, now is there? UPDATE I: Just how irresponsible and factually incorrect is it to some how portray Trayvon Martin as the symbol of innocence lost at the hands of gun violence when a the VIDEO below shows, Trayvon was no stranger to guns, fighting and drugs. “So you just turning into a lil hoodlum,” the person with whom he is texting says. “Naw, I’m a gangsta,” the text message read. In other messages, text message exchanges appear to be discussing guns. “U wanna share a .380 w/ (blacked out),” one text message sent from Martin’s phone reads. I think want happened to Trayvon is a tragic senseless loss of life. However, you people don’t know how information about the young man’s character was suppressed by the Judge, Travon was a THUG not a saint. Please open your eyes and stop trying to make a saint out of Trayvon. Memorials for Trayvon are alright just don’t go overboard. This is a church that has lost it’s way. If the people agree with this behavior, then the majority of the congregation is in trouble. I am ashamed as a christian for this group. This is taking an event that has nothing to do with the nativity and making an ugly unchristian statement. Makes one think that the church has embraced the Black Liberation Theology with it’s message of hate. OMG!!!! Travyon Martin was a thug. Replacing baby Jesus, baby Jesus can never be replaced. That nativity should be taken down. Travyon Martin was a punk kid!!!! I don’t even know where to start! The guy who did this and anyone in that church who agrees with him are all going to Hell! 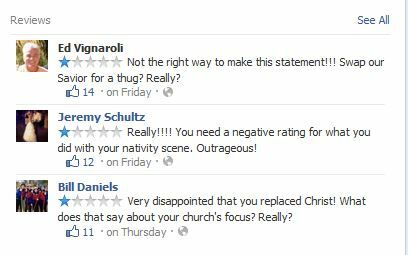 Wouldn’t surprise me if someone burned the church down, or at least the Nativity scene. People being bused into Sanford from out of state and standing in the streets and parking lots shouting “Justice for Trayvon.” I think he already got his justice. How do these people know he didn’t? Shows “mob mentality” at its best. What possessed Zachary to think he could replace Baby Jesus at all? Least of all with a hoodlum/gangsta wannabe. Church “leaders” exploiting the situation and putting this country on the verge of a race riot all over some punk who wants to be a badass and now this? Our country is headed for Hell at 90 mph!